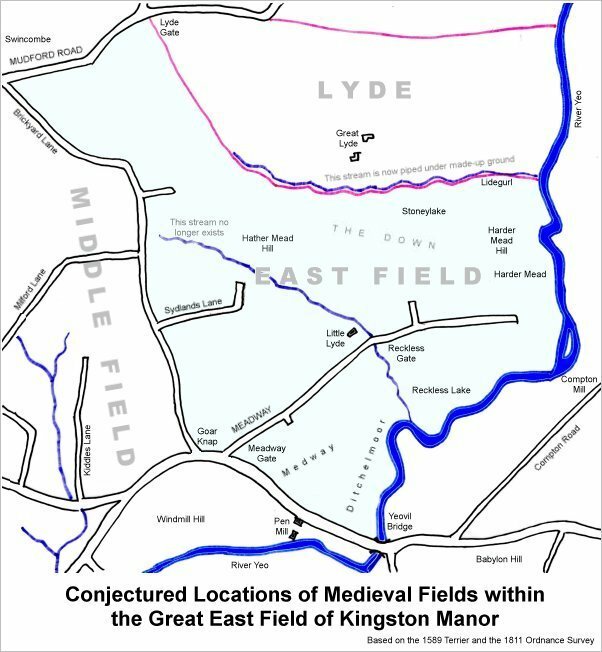 East Beachams Close (Parcel 872) and a small partitioned section known as In Beachams Close (Parcel 873) ran alongside Meadway at a location where today's Buckland Road joins Lyde Road. 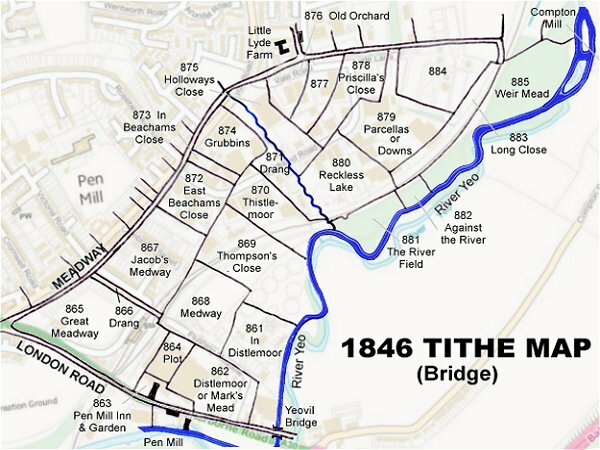 The 1846 Tithe Apportionment noted that In Beachams Close (Parcel 873) was owned by the Yeovil Almshouse and the tenant was Charles Marsh. The Apportionment noted that it was used as arable and measured 1a 0r 0p. East Beachams Close (Parcel 872), on the other hand, is not mentioned in the Apportionment at all. 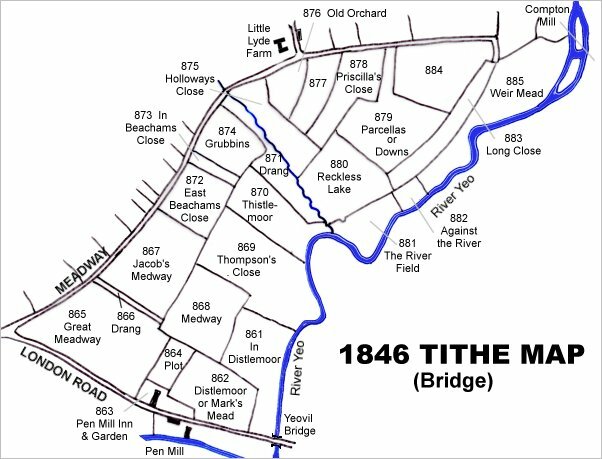 Nevertheless it was part of Pen Mill Farm and was recorded in a lease dated 25 March 1859 between the owner, Captain William Prowse, and John Stone of Pen Mill Inn for both the inn and the adjoining farm, in which it was recorded as arable and measuring 4a 3r 28p which apparently included both Parcels 872 and 873. East Beachams Close and In Beachams Close were bounded on the northwest by Meadway (today's Lyde Road), on the southwest by Jacob's Medway (Parcel 867), on the southeast by Thompson's Close (Parcel 869) and Thistlemoor (Parcel 870) and on the northeast by Grubbins (Parcel 874). East Beachams Close was not built on for many years and, as the 1927 Ordnance Survey shows, was used as allotments. 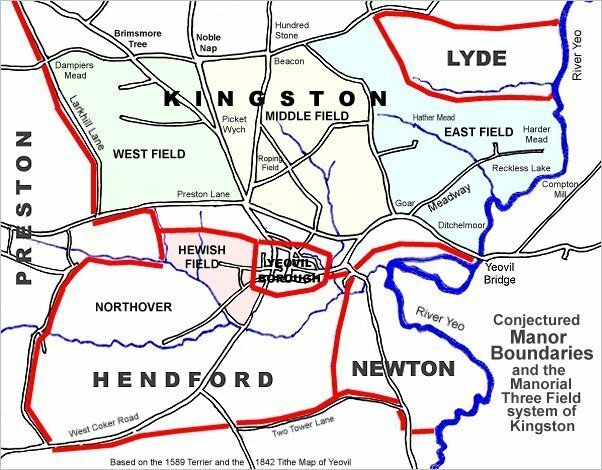 Today it is covered by Buckland Road from Lyde Road as far as the bend and includes the Tri-UK building to the southwest and houses and gardens along Lyde Road to the northwest with part of the trading estate to the east. 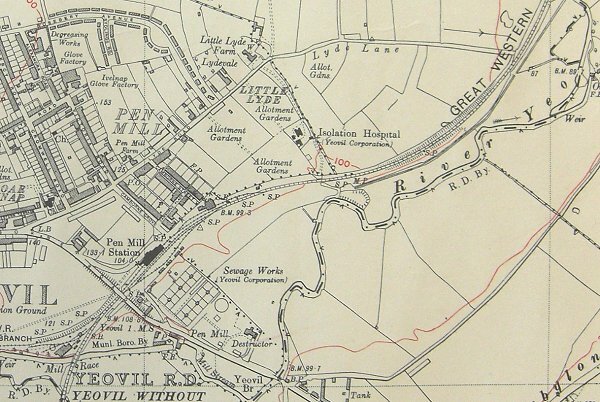 The 1927 Ordnance Survey showing the whole of the Pen Mill - Lyde Lane area. By this time East Beachams Close was used as allotments.